Cargo ships coming into San Francisco Bay must now follow new, narrower shipping lanes as they approach the Golden Gate. The change is designed to protect whales off the coast, as increasing numbers have been struck and killed by large ships. According to federal scientists, at least 20 whales have been killed and 10 whales have been injured or possibly killed off the California coast since 1988. But many believe most whale strikes go undetected. The cold waters outside of San Francisco Bay provide a rich feeding ground for humpback and blue whales. Gray whales are often seen close to shore as they migrate through in the winter and spring. 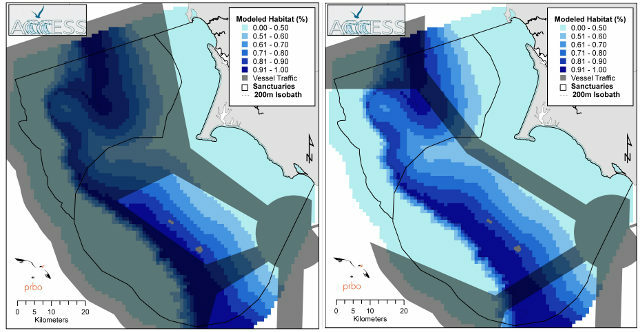 “We’re particularly concerned about blue whales not only because of the number of ship strikes, but also because blue whales have not been showing recovery off the West Coast,” Calambokidis said. The new rules extend the three main shipping lanes to San Francisco Bay, so ships are funneled into smaller zones as they approach shore. While the new changes are year-round, federal official with NOAA and the Coast Guard are also hoping to create dynamically changing shipping lanes, based on real-time whale tracking. 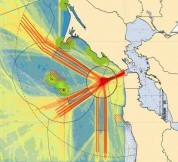 These “dynamic management areas” would go into effect when whales are spotted in a shipping lane. A temporary speed limit would go into effect, slowing ships down and encouraging them to use the other approaches to the Bay. To gather whale-tracking data, the federal marine sanctuaries off the coast are teaming up with non-profits to create a citizen science app called “Spotter,” available soon online. They’re asking whale watching boats, recreational boats, commercial fishermen and members of the public to report when they spot whales offshore. 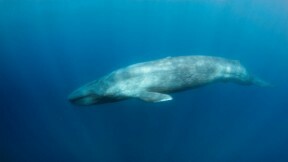 The data will feed into WhaleAware.org, managed by PRBO Conservation Science.